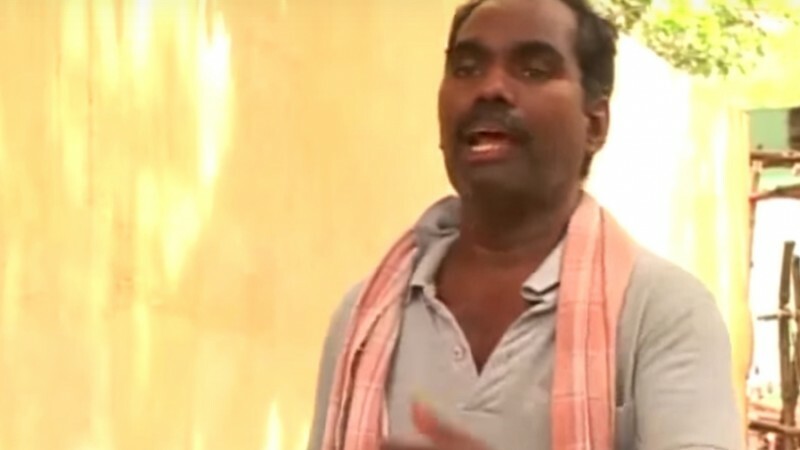 Arrested for singing a song critical of the government of the South Indian state Tamil Nadu, folk singer and activist Kovan has now been released on bail. His arrest is part of a larger crackdown on activism and freedom of expression. At the end of October 2015, the 52-year-old singer S. Kovan was arrested at his home in the Tiruchirappalli district of Tamil Nadu. After nearly two weeks of imprisonment, he was released on bail. The song, “Shut Down Tasmac,” criticises the state government for profiting from state-run liquor shops at the expense of the poor. The video shows a street play in which a woman dressed similar to Chief Minister Jayalalithaa is pouring liquor into a glass. According to The Hindu, a national newspaper in India, unidentified police sources claim that “while one has the right to criticise drinking, those doing so should not cross the limits.” The limits are unclear. Kovan was booked under various sections of the Indian Penal Code, including Section 124A, sedition and “wantonly giving provocation with intent to cause riot” and 505 part 1, b and c for “publishing and circulating rumours with intent to cause fear or alarm among the public and induce them to commit offence against the State or a class or community,” according to Chennai Central Crime Branch sources. Shortly after his arrest, Meenakshi Ganguly, South Asia director at Human Rights Watch, said that the arrest was “a misguided attempt” to shield Chief Minister of Tamil Nadu, Jayalalithaa Jayaram from criticism, and demanded his immediate release. “A law that is repeatedly used to arrest singers, cartoonists and writers has no place in a democracy – and should be repealed,” Ganguly said. No ordinary folk singer, Kovan is a leader of the People’s Art and Literary Association (PALA), an anti-imperialist protest organisation which uses art and culture to organise around socio-cultural issues. According to their Facebook page, PALA releases music including 11 audio cassettes of revolutionary political songs fighting against issues such as Brahminic terrorism and recolonisation, publishes a monthly magazine named ‘Puthiya Kalacharam’ (New Culture) which has been in print for more than 20 years, and organises with groups such as the New Democratic Labour Front (NDLF), Peasant Liberation Front (PLF), and Revolutionary Students Youth Front (RSYF) to advocate against globalisation, theAnubhav plantations, Coke plants, seizure of retail trade from small vendors, and other struggles around Tamil Nadu. Overall, the song is part of a broader movement to reinstate a liquor prohibition. The alcohol debate in Tamil Nadu and prohibition has a long history dating back to the 1930s. Protests against liquor stores flared up in August 2015 after 59 year-old Gandhian Sasi Perumal allegedly committed suicide in protest calling for the shutdown of a TASMAC shop in Kanyakumari. The protests, many of which are led by students and women, have at timesescalated, leading to destruction of property. Kovan’s case is not out of character for the administration. In the past four years of the All India Anna Dravida Munnetra Kazhagam (AIADMK) regime alone, over 110 cases of defamation have been filed by government. In her last regime, between 2001-2006, the Jayalalithaa-led government filed close to 120 defamation suits. Tamil Nadu is in a state of unannounced emergency. After arresting folk artist Kovan for criticizing the Jayalalithaa government, the atrocities continued at Egmore court yesterday. The police manhandled and assaulted media personnel when they attempted to cover the case. Tamil Nadu is seeing an unprecedented situation where human rights have become non-existent, there is no respect for law and order or the Constitution, and corruption has reached obscene levels. Neither Jayalalithaa nor Sasikala seem to be the least bit worried about the disproportionate assets case pending in the Supreme Court and are forcing businessmen to sell their assets to them. The recent Jazz Cinemas exposé by the media is one such instance that has come to light. Representatives from DMK state political party in Tamil Nadu say that this is an example of intolerance and an attempt to stifle democracy. “My father’s arrest is a threat to the people of Tamil Nadu and not just the organisation he worked for,” Kovan’s son Charuvahan said. Kovan’s lawyer Jim Raj Milton argues that there is nothing seditious in his songs. “There is an anger in Kovan’s songs, but there is also a logic behind that anger. This is an art form. It can only be seen as art. Even defamation cannot stand,” he said. Kovan’s arrest came in the wake of the decision of nearly 25 writers to return their literary awards in protest against intolerance under the federal government. Hindi writer Uday Prakash started the trend on 4 September 2015 protesting against the murder of Kannada Sahitya Akademi winner M.M. Kalburgi who was a progressive scholar of Vachana literature. As of 23 November 2015, at least 42 authors, essayists and playwrights havereturned their awards, including Arundhati Roy. This story was commissioned by Freemuse, the leading defender of musicians worldwide, and Global Voices for Artsfreedom.org. The article may be republished by non-commercial media, crediting the author Lakshmi Sarah, Freemuse and Global Voices and linking to the original. This entry was posted on December 15, 2015 by Lakshmi Sarah in Global Voices.